Wedding Videographer Dublin – Leeann and David – 21’st June 2012. 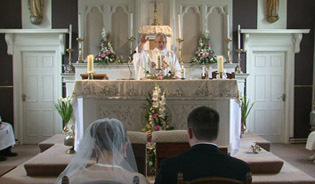 I was the official wedding videographer at the wedding of Leeann Finnegan and David Reape on 21’st June 2012. I started the day at Leeanns’s house were the bridesmaids were having their hair finished off by Louise O Rourke (087 1337686), the make up artist was Janis Murphy and both girls did a great job, the bride and bridesmaids were all in great form and were all set for the big day ahead. I set off to the The Holy Sprit Church in Walkinstown, this was my local parish growing up and I have a lot of memories standing at the back of the church when I was a teenager ha ha, Fr. Myles Healy celebrated the mass and he did a lovely job. The church music was by Ruth Cahill Soprano her voice was beautiful and even though it is a big church she could be heard perfectly. We set off for the wedding reception in Dunboyne Castle, the wedding car was a 1962 Bentley from Connolly Chauffeurs, even though it was forecast for rain we didn’t get a drop, the Child of Prague that was stuck in the flowerpot at Leeann’s house definitely did it’s job. 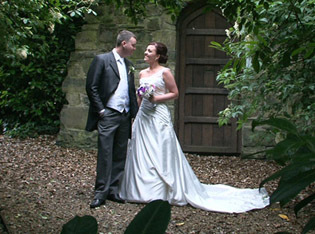 The wedding photographer was Michael Crean and Dunboyne Castle was the perfect location to get some spectacular photos. Tom and John looked after our every need in the hotel and did an amazing job as always. We had a speciality act by two Latin American Dancers, Laura Nolan and Stas Wakeham who were fabulous and entertained us for ten minutes it was so so different from the normal acts people have. The wedding band were a new band called Shine and they were very good we then had Dave from Prodjs who took them into the late wee hours. A great day had by all and I look forward to having the wedding DVD’s ready. 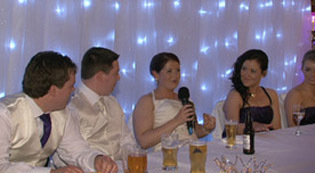 Wedding Videographer Dublin – Bernie and Mick – 23’rd June 2012. 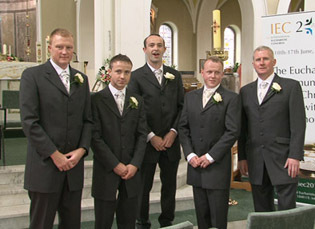 I was the wedding videographer at the wedding of Bernie Mc Donald and Mick Daly on 23’rd June 2012. The Church was St Peter and Pauls in Cross Bridge just outside Tinahealy Co. Carlow, Fr Thaddeus Doyle celebrated the Mass and it was a lovely ceremony. The church music was by 3 of the Dublin Gospel Choir as the church could not accommodate them all, they did a great job. We set off for the wedding reception at the Dolmen Hotel and the happy couple went in style in a 1964 Rolls Royce from Classic Car Company. We only got a drop of rain and as we were expecting rain all day so it was a pleasant surprise. Ken Meaney was the official wedding photographer and was lovely to work with. Clare Kavanagh from the Dolmen Hotel was looking after us and did a great job for the day. 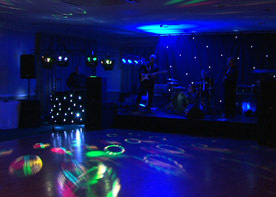 The wedding band were Goodfellas and as always they had the room rocking, then we had Greg from Prodjs who took them into the late late hours, the uplighters in the room added a great touch. A brilliant day and I look forward to meeting up again when the wedding DVD’s are ready. 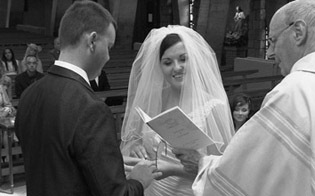 I was the official wedding videographer for Amy Smith and Derek Burke on 2’nd June 2012. I started filming in the house where Amy, Lindsey, Carley and Emma were having the final touches done to their hair and make up, they all looked beautiful. 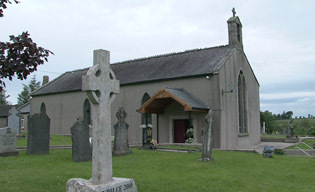 The church was St Agnes’s in Crumlin Village and it was decorated lovely, Fr Peter Coffey celebrated the mass there was a lovely atmosphere through out the mass. The church music was by Jenny Mc Cabe and she did a great job. The photographers were Pat and Clare From Photohouse in Malahide and they got some amazing shots and are lovely to work with. We set off to the wedding reception in the Amber Springs Hotel in Gorey Co Wexford and we were met by the fabulous wedding team who did a great job and made sure everything ran like clockwork. In the evening we had the wedding band CSI they were just magical and had a great way with the crowd, if you need a band up do check them out they had them rocking for the night. I look forward to catching up with Amy and Derek when the wedding DVD’s are ready.